The United States Association of Blind Athletes (USABA) in partnership with Vermont Adaptive Ski and Sports will host its largest gathering of skiers who are blind and visually impaired at its Sixth Annual Winter Ski Festival in Killington, Saturday, Feb. 9 and Sunday, Feb. 10 at Pico Mountain. Up to 30 athletes with visual impairments will be given the opportunity to learn to ski or race in the sports of Alpine and Nordic skiing, while spending a weekend in the Green Mountains of Vermont. Athletes will be attending from New England states, and as far south as Florida and North Carolina and west to Pennsylvania, Ohio, Wisconsin and Minnesota. The event is open to all ages, all abilities and all ski levels. Trained guides and instructors are provided by Vermont Adaptive, the largest year-round disabled sports non-profit organization in Vermont, which is committed to empowering individuals with disabilities. In addition, six athletes from Vermont were awarded scholarships for their winning essays from a contest held by the Vermont Division of the Blind and Visually Impaired and Vermont Adaptive. Applicants had to write about how sports and recreation help other aspects of their lives and how they would help spread the word to other people about the importance of sports through the programs of Vermont Adaptive and USABA. Grant funding for this program is awarded by U.S. Paralympics, a division of the U.S. Olympic Committee, through funding provided by Veteran Affairs. The grants are provided to facilitate the growth of Paralympic-sport programming for disabled Veterans and disabled members of the Armed Forced. For more information, visit http://www.usaba.org or contact: Mark Lucas at USABA at: (719) 352-9134 or Tom Alcorn at VASS: (802) 353-7584. Since its founding in 1976, the United States Association of Blind Athletes, a community-based organization of the United States Olympic Committee, has reached more than 100,000 blind individuals. The organization has emerged as more than just a world-class trainer of blind athletes, it has become a champion of the abilities of Americans who are legally blind.For more information, please visit our Web site: www.usaba.org. Vermont Adaptive Ski and Sports is the largest year-round disabled sports non-profit organization in Vermont offering the most diverse program opportunities and unique, specialized equipment. Vermont Adaptive promotes independence and furthers equality through access and instruction to winter and summer sports and recreational opportunities. For more information, visit www.vermontadaptive.org. Vermont Adaptive Ski and Sports, the largest year-round disabled sports non-profit organization in Vermont offering the most diverse program opportunities and unique, specialized equipment, will host its annual Ski Challenge fundraising event on Saturday, March 10 at Pico Mountain. A retro '80s is this year's theme © 2012 Karen Rubin/news-photos-features.com. Vermont Adaptive Ski and Sports, the largest year-round disabled sports non-profit organization in Vermont offering the most diverse program opportunities and unique, specialized equipment, will host its annual Ski Challenge fundraising event on Saturday, March 10 at Pico Mountain. A retro ’80s is this year’s theme. People do not have to participate in the race to attend the family-friendly gala after the day’s event. Gala-only tickets are available. In addition, Killington Resort and Pico Mountain are providing lift ticket and season pass fundraising incentives in order for the non-profit to reach its event goal of raising $100,000. Every $100 in pledges enables Vermont Adaptive to provide a full-day skiing scholarship. The cost of an outing with Vermont Adaptive for the consumer can range from a $15 for a two hour canoeing session to $90 for a full day ski lesson, including instructors, ticket and adaptive equipment. All of the school and advocacy groups that the organization works with are also subsidized by Vermont Adaptive; school groups are charged a reduced rate starting at 50% off, and participants receive the same one on one experience as any individual who participates. This year’s Ski Challenge includes a day filled with skiing and fun, timed racing and a night complete with family-friendly grazing stations with a retro-’80s theme and music, awards, and dancing. Saturday begins with check-in for participants from 8 – 9:30 a.m. in the Sunshine Room in the Pico Mountain base lodge. The fun race begins at 10 a.m. The race is open to all ages and abilities of skiers, riders and tele-skiers. Each racer will complete two times runs. Participants are encouraged to create teams of three and compete in costumes as well. Awards will be made in various categories for all participants, from best individual times to fasted teams, best costume, youngest and oldest participants, as well as acknowledging top fundraisers. Beginning at 4 p.m. the event moves to the Killington Grand Hotel. A cash bar and Silent Auction begin at 4 p.m. Then the night continues with awards, dinner and dancing. The Silent Auction will wrap up around 7:30 p.m. A DJ will be spinning retro ’80s tunes. Registration includes a special wool IBEX Outdoor Clothing beanie as well as full-day lift ticket for March 10, 2012 to Pico, Ski Challenge festivities, awards, and the après-ski party. Apres-ski party tickets can be purchased in advance as well. 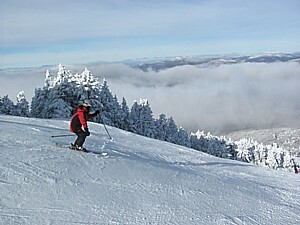 Registration is online at www.vermontadaptive.org.